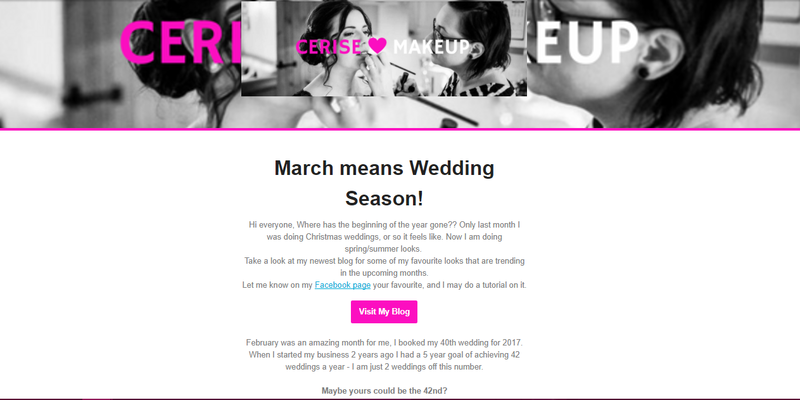 The lovely Laura at Cerise Make-up wanted a way to stay in touch with her previous clients as well as those who had shown an interest in her services at events. I organised with her to start up an email campaign as she already had hundreds of emails to use. Using her colour theme and images from weddings I was able to compile a basic template she loved. Every month I update it with information about where she will be showcasing, new tutorial videos for her make up lessons and a little intro. Laura writes the intro so it is personal to her and identical tone to what her audience is used to hearing from her.